The photo, posted by the RSCPA itself, has triggered backlash from supporters and activists around the world who argue that serving abused animals is inconsistent the organization’s stated mission. 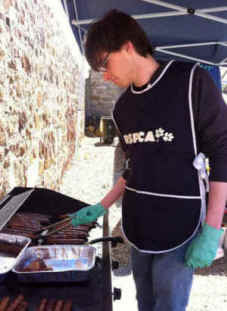 The Royal Society for the Prevention of Cruelty to Animals (RSPCA) in Tasmania, Australia, has triggered anger and confusion by serving sausages at a fundraiser and defending its decision to do so. The RSPCA believes you can eat meat or eggs and still care about the welfare of the animals that provide it. These animals are living, feeling creatures, capable of experiencing fear, pain and distress. The RSPCA believes all animals should be treated humanely, whether they’re animals we farm for food or live with as companions. If the RSPCA, whose mission is protect animals, can’t connect the dots between the cruelty it opposes and the cruelty it supports, then how can the organization expect the general public to shift toward a cruelty-free lifestyle? Their decision to serve and condone the consumption of meat makes the RSPCA part of the problem, not the solution.